As Breast Cancer Awareness Month comes to an end, I decided to recreate an image a strong, resilient and fearless woman to be a reminder that there is so much more to this fight then just this month. The history of this picture, “Rosie the Riveter”, in so many ways speaks to the power of women and the women who fight this awful sickness that could affect any of us. I learned at a very young age that cancer sees no face, body type, gender, ethnicity, or for that matter, even cares about how much you care for the person diagnosed. I could go on and on about the women in my life who have inspired me in more ways than imaginable but since cancer has no preference, I will direct my focus to what we can do to help, Hope for the CURE and most importantly why it is so important to do self-exams. 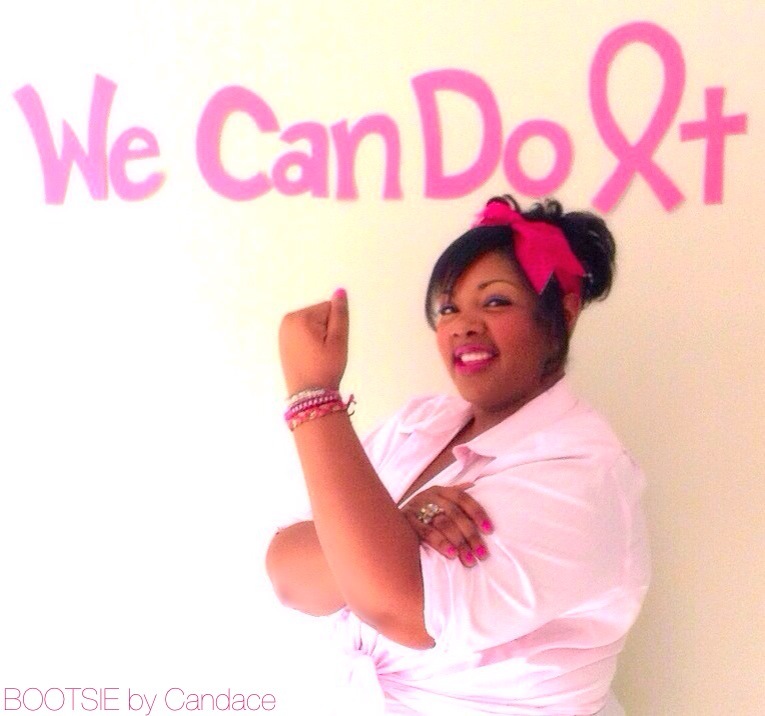 1 of every 8 women WILL be diagnosed with breast cancer at least one time in their lives! Let that sink in… another shocking statistic, there is a 98% survival rate for a woman who has detected the cancer early compared to under 30% survival rate for a woman who detects the cancer later… to sum that up, EARLY DETECTION is the very thing that can Save Your Life! I get the impression that younger women don’t find the need to do self-exams because “We haven’t reached that age yet” or “I don’t really have the history in my family” or even more frequently “I live a healthy lifestyle”…. Well ladies, you could not be more wrong! Self-exams and mammograms are a part of life that nobody really wants to address BUT it is imperative that we become comfortable with handling our own self health. As scary as it seems, I am hearing of more and more presumably healthy women and younger women that are being diagnosed with breast cancer. Now I’m not 100% sure if the age that women are being diagnosed with breast cancer is becoming younger OR if more women are becoming more comfortable or even proud to share their stories. Whatever the case may be, it’s happening! We MUST be proactive in our health! Do your research ladies and know your body. Many women overcome cancer and continue to live healthy lives; early detection makes all the difference… YOU are Step 1! Upward and Onward! A Prayer, a Donation, Volunteer Time, Fundraisers or even Running in a Race… Everything Helps! Together we can move mountains and Find a CURE! Research has come such a long way in part because of all the attention that breast cancer has gotten. We must continue to shine a light over this, we must continue to urge for funding toward research. Get involved with your community if you want to see firsthand what your help is doing or on a bigger scale get involved with an organization. We are in this together, WE CAN DO IT! To all of the Beautiful Survivors in my life AND beyond… I Salute YOU, I Commend YOU, I Admire YOU, We Honor YOU, I Humbly Feel YOU and I LOVE YOU! In honor of Breast Cancer Awareness month, I recreated the infamous “Rosie the Riveter” poster!